Jim Carrey was cute in that movie!!! Haha I know right! I told my friends that he was cute, and they only saw dumb and dumber, so they were like "your CRAZY!" But I think he's cute no matter what he does! seriously cute... yipee!! it's going to be one of the Saturday night movies on Channel 5 in a few weeks, yes I know you can watch it anytime but there is something speacial about it being picked for a TV slot nd they have it in one of those brilliant trailers they do with music over it previewing all the films over winter, just wants to make you see it even more. Jim just answered someone in Twitter about it! Jim says "I'm ready" - well me too Can't wait for this one! Hope filming starts soon & all goes nicely there! Thats too bad that people seem to think that James owe's them something, he does not, thats too bad people expect things from he, when he really owe's nothing to no one..
let him be, just let him be, who he is, who he wants to be..
Whoah, where does that come from? 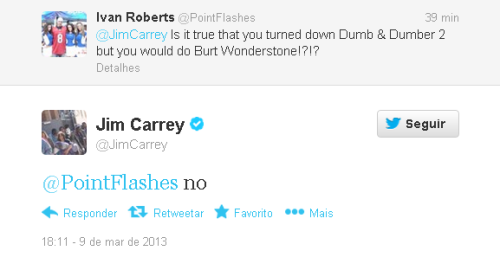 I don't think Jim HAS to do Dumb and Dumber 2. He has enough money to never work again. He probably also makes this movie because he likes doing it. In the end, he rather wouldn't stay true to himself if he only made movies like Eternal Sunshine or The Majestic because funny grimace movies are where his roots are and what made him famous. And I'm sure he did not make that just because he had to, but because he enjoyed it. I don't want to say by that that he owns it to his fans or to himself. He doesn't own anything to anyone in that regard. But I'm more than happy to see the old crew coming together and do that sequel. Especially, if it turns out to be as excellent as the first Dumb and Dumber, which still is my most favorite movie. -->Blunt<-- wrote: Whoah, where does that come from? I don't think Jim HAS to do Dumb and Dumber 2. He has enough money to never work again. He probably also makes this movie because he likes doing it. In the end, he rather wouldn't stay true to himself if he only made movies like Eternal Sunshine or The Majestic because funny grimace movies are where his roots are and what made him famous. And I'm sure he did not make that just because he had to, but because he enjoyed it. That's awesome that you support in this way! I love Jim in comedies without a doubt!!" He is the best!! And yes that is how he be became noticed through his 'persona that shines all aspects of his colourful multi rainbow personality and being a joker stood out at first but he has evolved and changed since then, his choices all of them is choices, I respect all that he is ,all that he has done, and all that he is going to do without judgement or disapiontment or complaining like I seem a bit have done here and there...when u love something about a person you accept who they are and who they are becoming. And embrace it all, past, present and what's to come. Not the opposite. God bless Jim in all that he does and god bless us too.. I see, so you also like the comedies. That's good, I first thought you are one of those who only like the love movies and thinks that he does the funny ones only under pressure of the fans these days. . And hey, that's the second time I was blessed, today, hehe. And yes that is how he be became noticed through his 'persona that shines all aspects of his colourful multi rainbow personality and being a joker stood out at first but he has evolved and changed since then, his choices all of them is choices, I respect all that he is ,all that he has done, and all that he is going to do without judgement or disappointment or complaining like I seem a bit have done here and there...when u love something about a person you accept who they are and who they are becoming.